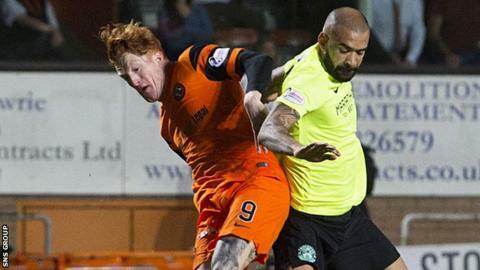 Hibernian have signed Dundee United striker Simon Murray. The 25-year-old scored 18 goals for United this season and leaves Tannadice under freedom of contract after their Premiership play-off final defeat. He signed for United from Arbroath for £50,000 in January 2015 and was loaned back to the Red Lichties for the remainder of the campaign. Hibs boss Neil Lennon said: "Simon is a great player, one who enjoyed a personally solid season with United." Murray is Lennon's second summer signing following a deal to recruit midfielder Danny Swanson from St Johnstone. His father, Gary, played for Hibs in the 1980s, having joined from Montrose, where Simon started his career. "He's strong, he's quick with a good turn of pace, plus he knows how to find the back of the net," the Hibs boss told his club website. "He has fantastic attributes and a real hunger to continue to improve as well - I'm delighted to have secured his services for next season. "With the players who have renewed and Danny Swanson coming in as well, I believe we are moving in the right direction with our recruitment, and that process is still ongoing to ensure we have as strong a squad as possible for the club's return to the top flight."